Biology Professor Dr. Rosas Acosta teaches large enrollment classes and first implemented online exams in fall 2017. He needed to simplify the grading process and give students immediate feedback on exam's performance. 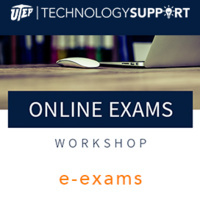 In this presentation Dr. Rosas Acosta will share his approach to online exams and Technology Support staff will provide a live demo of the required technologies for online exams. A set of Apple Air Pods will be given to one lucky instructor in attendance.